Ten years have passed and I’d say its turn has come. Indian food has pretty much become ubiquitous and, aside from the numerous Indian restaurants around, some element of the Indian spice palette shows up in on every menu that offers any kind of global or fusion cuisine. The consulting chef for The Hundred-Foot Journey was Floyd Cardoz, and now I’m sorrier than ever that I never made it to Tabla in New York during the day to enjoy his upmarket fusion Indian cuisine. I still remember his scallops in coconut milk, served in a mini coconut, at the James Beard Awards reception one year. It was a delicious eye-opener for me, culinarily speaking. 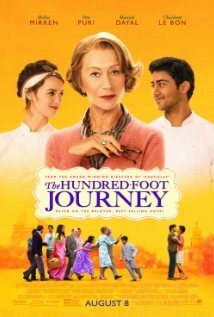 As a marketing tie-in, I noticed on Amazon that The Republic Of Tea has even created a special tea in honor of the movie, The Hundred-Foot Journey Cardamom Creme Brulee Black Tea. Sounds like there’s a lot going on in that tea, but it does remind me how much I enjoy spiced chai tea with milk, even iced (maybe with coconut milk?) And Le Cordon Bleu has a website promoting the movie (and themselves, of course), although I can’t for the life of me understand why the recipes there don’t offer versions with a touch of Indian spice, rather than classic French seasoning. No matter, I did really enjoy the movie, although I can’t disagree with critics who say it lacks heft. That’s fine by me, I like my cinematic entertainment on the “lite” side; I don’t want to be preached to, and I can, sadly, see real violence on the evening news every night. (I found the previews we were forced to watch before the movie aired truly disturbing.) Also, the book sample I downloaded on my Kindle is good, it was published several years ago, and I would like to read it – but I’m holding out for it to become available as an e-book through my library.